"And what is Mr Spectre's postcode? SW 19? Right that's fift...a hundred pounds. Now about long term treatment for his personality disorder.... "
However, since Mr T was made redundant I've had to economize so I've worked out Mr Spectre's problems myself. I've watched him defecate in the hallway, in the bathroom and on the upstairs rug. I've watched him eat a croissant and a blueberry smoothie and chase his tail around and around in circles. He stalks Mr Bond and anything resembling mice, toes and legs or indeed any part of the lower body. When he's not attacking me when I'm in a defenceless position in the bathroom, he's under my feet in the kitchen or on my chest looking at me with evil eyes. And when he not glued to my side like a limpet he's camped on the stairs where he can see all the action and is in prime position to attack any pair of passing feet. He rarely appears to sleep and he is constantly talking to me. If I speak to him he meows right back. He is probably the devil in disguise but the one thing I am sure about is - He is nuts. Mrs T: I thought you said you wanted to go outside? Mrs T: It's too cold for you? Mrs T: Oh you do want to go outside! Just getting use to the temperature? Mrs T: Aren't you going outside then? Mr Spectre: Meow, meow, meow...........meow, meow, meow. Mrs T: Hmm...I see - you want some food? Mr Spectre: Meow, meow, meow. Mrs T: I see - you want meat? Mrs T: What?! You want chicken flavour? What's wrong with beef?! Mr Spectre: Ahhh....meow, meow, meow, meow, hiss, meow. Mrs T: Hmm... how about a... a croissant? Yep, so what you can tell from this typical conversation is that I spend a lot of time talking to animals. (Bear in mind there are 7 chickens in the garden.) Now I like to think I know what animals are saying and I wrote about this attribute in my post I can talk to the animals. However, the sad truth is, Dear Readers, is I don't have a sodding clue what they're saying. Which probably just means I'm a mixed up middle class woman with a deep seated psychological problem. Luckily, my problems are probably not so great as the people who Goggle "I can talk to the animals", " My parrot and I are in love" and "My cat told me to speak to a medium" and who end up here on my blog on my post I can talk to the animals. Now those people are genuinely NUTS. The most interesting thing about Statcounter though is discovering what phrases people put in Google which bring them to my blog. I am always deeply satisfied when someone has got to page 274 on Google and has then clicked on my blog. It's good to know that after wading 274 pages of rubbish something catches their eye about my writing. Anyhow, my two most popular searches at the moment are Saucy Story (My short story Caught Short) where I am paged ranked no 1. 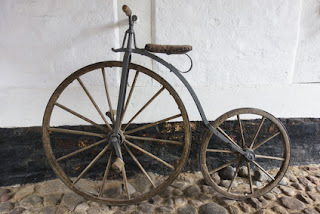 (Fame at last - wish I'd made it into an Ebook) and my post The Bike with One big Wheel and One Small Wheel which is also ranked on page one of Google. 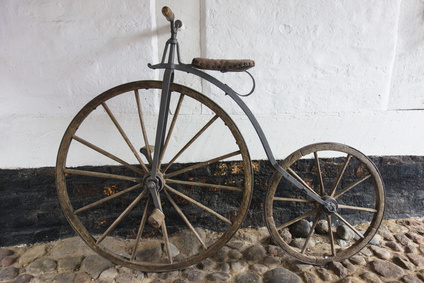 Now I should be thrilled about this but the sad fact is far, far, far, too many people don't know that The Bike with One Big Wheel and One Small Wheel is called (and I say it once again) A PENNY FARTHING. Produced, presented and directed by Jane Turley. I repeat... it is called ....A PENNY FARTHING. Then the credits will roll. Right - so that's today's writing therapy. God knows what tomorrow will bring. Everyone talks to pets don't they? And it would be stupid to use your 'everyday' voice; they wouldn't understand! I don't know if everyone talks in silly voices - but at least I know you do now, Martin!